Home » Analysis & Opinion » Toronto FC vs Vancouver Whitecaps: Will TFC Be Going For CCL Glory Next Year? Toronto FC vs Vancouver Whitecaps: Will TFC Be Going For CCL Glory Next Year? Always a good time to use this photo. Voyageurs Cup Final time!!! It’s the best time of the year, it really is. Tonight’s match paves the way to next year’s CCL – you all remember how achingly close Toronto FC came to winning it, right? Sigh. TFC have unfinished business, and we as fans want nothing more than to see them return and become the first Canadian (and MLS) team to win the tournament. But first they have to get past the Whitecaps. Last week’s match had some of the trademark craziness that has been the hallmark of the Voyageurs Cup matches between these two teams; red card, penalty, own goal and a result that favours Toronto – great stuff. So what will happen tonight? Freak hail storm, swarm of locusts, alien invasion – really anything can happen when these two teams come together to contend for the V Cup. Don’t be fooled by that weather forecast, the weather gods haven’t had a chance to mess with us for awhile. Last week Vanney held some players out to rest them for the match against the pizza rats (SIGH), but I doubt we’ll see the same tonight. There are a couple of obvious starters in Jozy Altidore and Chris Mavinga – *players with reds, are starting tonight, what a sight* – as both are suspended for this weekend’s match against the Quakes. For the CanCon contingent I’m assuming Jonathan Osorio, (Dr) Ashtone Morgan and either Liam Fraser or Jordan Hamilton will get the start for TFC with Jay Chapman, Ryan Telfer and Tosaint Ricketts on the bench. And even with an away match to San Jose on Saturday, I’ll be very surprised if the rest of the starting XI isn’t comprised of their top players, getting back to the CCL means a lot to the club. Stay disciplined – I know cards won’t affect the season, but TFC need to get themselves in check – other MLS teams are watching, you can bet they’ll try to take advantage of those lapses in cool by Toronto’s players. To whomever is presenting the trophy: no matter what Jamie says, it’s NOT HEAVY! Also, don’t drop it! You won’t, but it has to be said. Tonight’s a great time to bust out your Canada national team or Voyageurs gear. Don’t let Kei Kamara do anything (score) that will give him a reason for a Mountie celebration or something. 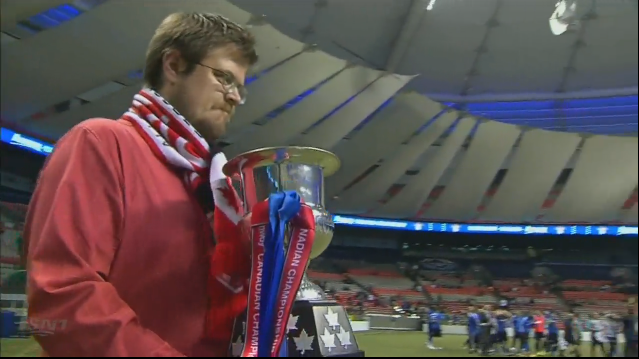 Please let TFC win – this year has been so weird, some kind of trophy goodness would be lovely. Tonight is an all to play for situation, and we should see a game reflective of that – TFC need the positive boost to their season and Vancouver need to get the ‘can’t beat Toronto in the VCup final’ monkey off their back. Both teams have important MLS matches this weekend, but all the focus will be on tonight’s contest – expect a fast, attacking game from both sides – both teams have explosive forwards and clever midfielders, TFC are the better team, but in the Voyageurs Cup anything can (and usually does) happen; I’m sticking with my 2-1 Toronto victory prediction from this week’s podcast – come on boys, there’s unfinished business to attend to .